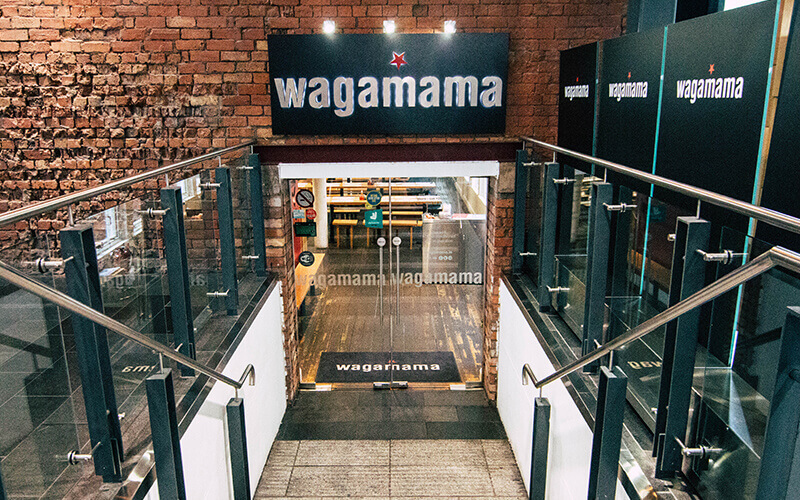 With a Japanese-inspired menu Wagamama offers a wide range of delicious noodles, rice and side dishes, desserts, freshly squeezed juices, hot drinks, wine, sake and Asian beers. We have a number of different ways of serving our noodle and rice dishes including ramens (big bowls of noodles in soup); teppan (noodles cooked on a hot, flat griddle); and kare (noodles in a coconut based soup). Some of our favourite main dishes include chicken katsu curry, chicken breast deep-fried (or grilled) in panko breadcrumbs, served with a curry sauce and sticky white rice; another is our teriyaki steak soba and our signature dishes – chilli beef ramen, yaki soba and ginger chicken udon being some of them – are still favourites with customers. We are also well known for our sides, particularly our gyoza; ebi katsu and chilli squid. Sides are perfect with a main meal, but also work perfectly when groups want to share a large selection. Besides our main menu, we offer a separate children’s menu and have seasonal specials. Within all our restaurants worldwide, we ensure a large proportion of our signature dishes remain on the menu; together with a number of locally inspired dishes.